Pop Culture Lunch Box: What Will the Gulf Look Like When the Oil Stops? Here's my weekly environment column for NetGreen News. You can see all my columns here. 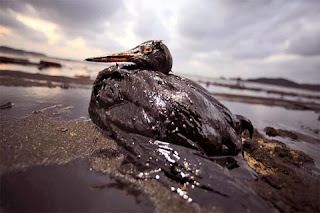 The Washington Post has reported the latest estimates of animals dying from the oil volcano beneath the Gulf of Mexico. Nearly 400 dead birds and dozens of dolphins and some of the world's most endangered sea turtles have all perished. Experts claim this is really a smidgen of the total species kill that is unfolding in the wake of the Deepwater Horizon spill. Many of the animals will be so weakened by their coatings of toxic oil that the fierce carnivores of the region will have a feast. Other than the fact that all these dead animals are terrible for biodiversity and BP's image, what would be the actual real-world results of a Gulf with little or no life? For starters, the beaches that are slowly being contaminated by oil will become a low-priority destination for beach-going vacationers and their tourism dollars. For those who do venture onto the beaches, there won't be much wildlife to see. So birders and swimmers need not apply. The Gulf used to be known as one of the most productive fish and shellfish catching grounds in the world, largely because fish dwell along its broad continental shelf. It would routinely pull in about 2 billion pounds each year. This amounted to a fifth of U.S. catches and a fourth of revenue generated from domestic catches. These numbers don't include the massive attraction to recreational fishing in the region, which will remain depleted for the foreseeable future. The $300 million annual trove of oysters for Louisiana fishermen appears to be a lost cause. Although the oysters themselves may survive the oil toxins, they will not ever be edible. Same goes for the region's shrimp. The already endangered Gulf whale population is likely to expend unusual amounts of energy to swim away from their polluted natural habitat. Experts are unsure how these migratory patterns for whales and other species will affect the area in the long-term. In the end, the Gulf may be slightly ahead of the curve. A major global study published in the journal Science found that all the world's commercial fisheries would be gone by 2050 anyhow. That means our over-fishing of the past 50 years is creating the extinction of all fish - and fishing - within most of our lifetimes. One author of that study said that "our wild seafood will be little more than sea squirt soup." On the flip side, the now-notorious Minerals Management Service claims that offshore operations in the Gulf produce a quarter of the U.S. domestic natural gas and one-eighth of its oil. Not that we should believe this agency, but gas and oil exploration is certainly something energy experts, environmentalists, and politicians can't rule out. Let's hope Congress takes this opportunity (unlike Obama) to begin debating the merits of fossil fuel use versus protection of a beautiful domestic resource like the Gulf of Mexico and its surrounding coastlines.